Above is the complex permeability characteristic of the #43 material used. 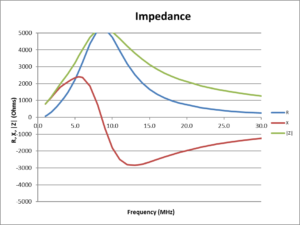 Inductance calculators that do not take that frequency dependent complex characterisitic into consideration produce invalid results. (Duffy 2015) gives a suitable approximation, and there are links to calculators that do work properly at the bottom of this article. The core used is the most common low to medium grade ferrite that is a real candidate for this application, the choice is a baseline against which others like #31, #52, #61, F14, etc can be compared. Not only is it really well suited, but it is the cheapest of the lot. If you think you found a better suited core to your own application, use it but redesign the number of turns to suit and measure the outcome. Above is a model of the expected Zcm with 11 turns of RG58C/U coax and an equivalent shunt capacitance of 4.6pF. The model is based on Zcm-43.xls which is an implementation of the method at (Duffy 2015). The model is very sensitive to the value of equivalent shunt capacitance and in this case was calibrated to the measured self resonant frequency of the prototype. Measured Zcm (Rcm,Xcm) reconciled well with the calibrated model. Icm measurement was mentioned in the article. See (Duffy 2011) for more detail on the technique and equipment. Icm was measured in a test on my G5RV at 7.1MHz to be 28mA at 100W. The current measurement is specific to the test scenario. The power dissipated in a current balun in typical antenna use is mainly due to the effect of core flux due to common mode current. It can be estimated as I^2R where I is the magnitude of common mode current and R is the R component of Zcm. So, it is difficult to rate them for a safe handling power, though it is easy to apply a rating for the power they can handle on a matched dummy load with no common mode current… easy but meaningless. Some key information: the coax insulation is PE and should not be allowed to exceed about 60°. On that basis, on a hot day of 40° a temperature rise of up to 20° is acceptable. A PTFE insulated coax (RG142 or RG400) will withstand much higher temperature, but the PVC enclosure used will not. The curie temperature of the core is about 130° and that must not be exceeded, so a bare unenclosed balun in free air and using PTFE coax might well accommodate 80° rise over 40° ambient. Whilst mentioning RG142 and RG400, be aware that most of those type of cables use silver plated copper clad steel inner conductors and the high conductivity plating may not be adequate for copper like performance at the low end of HF. 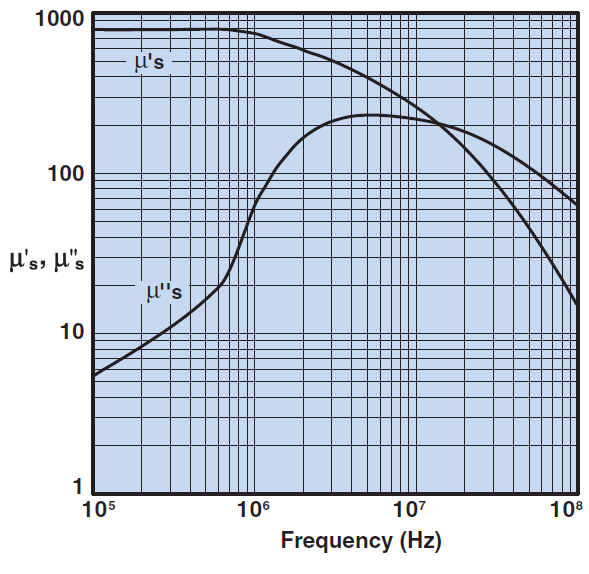 If the datasheet does not show attenuation below 10MHz, you have been warned. Encapsulating reduces ability to dissipate heat, potting may be even worse (depending on the potting compound). 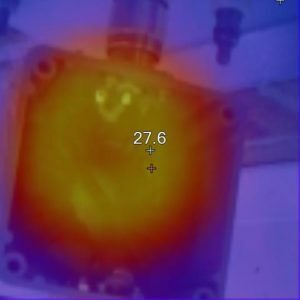 This thermal test is specific to the test scenario. Above is a thermograph of the balun after 5min at 50W continuous input on my G5RV on 7MHz. Temperature before the test was 20.1° and temperature rise is 7.5°. 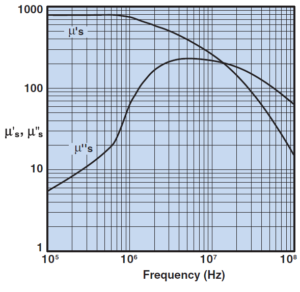 A 100W transmitter on continuous A1 Morse code would have a similar average power, a 1000W SSB telephony transmitter would also have similar average power. In this test, the temperature is well within the permitted 20° temperature rise. The measured R component of Zcm is 5500Ω, and Icm is 0.02A, so P=0.02^2*5500=2.2W. The toroid assembly needs to be secured in position, and without pressure that may deform the coax. Above, a small piece of 6mm cast acrylic sheet is tapped M4, and used to secure the toroid assembly with a M4 nylon countersunk screw through from the underneath of the box. Apply only gentle pressure. An alternative method would be to cut some packing out of a good dielectric (eg polyethylene cutting board) to fit between the lid and toroid assembly. I am not a fan of the commercial implementations which use nylon P-clips and zip ties, the net abounds with pics where they are broken. 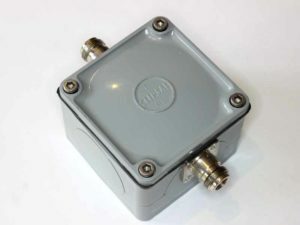 Protect the internals of connectors and the balun itself from water. Keep in mind that sealed enclosures breath vapour through imperfect seals, vapour that may condense inside the enclosure and accumulate to be troublesome. It may be wise to install a weep hole large enough to drain condensate but small enough to exclude insects etc. 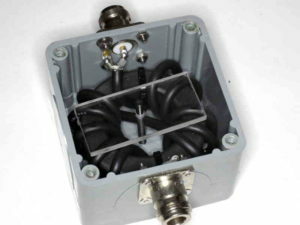 Most of the secret recipes for weatherproofing coax connectors are flawed, the more complex, the more likely to fail. Duffy, O. 2008. A model of a practical Guanella 1:1 balun. https://owenduffy.net/files/GuanellaBalun01.pdf. ———. May 2011. Measuring common mode current. https://owenduffy.net/module/icm/index.htm (accessed 21/02/12). ———. Mar 2012. Common mode choke design tool. ———. 2015. A method for estimating the impedance of a ferrite cored toroidal inductor at RF. https://owenduffy.net/files/EstimateZFerriteToroidInductor.pdf. Next Next post: What is a Ground Plane Antenna?